Big Big Train will release a double live album, A Stone’s Throw From The Line, on December 2. 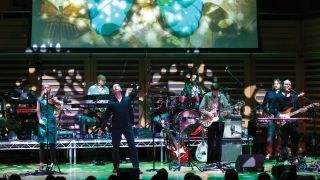 The album was recorded at the band’s live shows at London’s Kings Place in August 2015, which garnered the band the Live Event award at this year’s Progressive Music Awards.Those shows saw Big Big Train return to the stage after a 17-year absence. A Stone’s Throw From The Line will be a two CD set featuring the best performance of each song from the three Kings Place performances, and the tracklisting reflects the running order of the show. The album comes is a gloss, laminated soft pack with a 40-page booklet. A Stone’s Throw From The Line will be available via pre-sale through The Merch Desk and Burning Shed from today. It will be officially released on December 2.